The Timken Co. simplified interchanges to Timken driveline center support truck bearings by converting its parts nomenclature to align with familiar industry part numbers. This change makes it faster and easier for customers to find the right Timken driveline center support bearings, also called hanger bearings, for major truck applications. For customer convenience during this transition, the systems and packaging feature both the original and updated part numbers. Timken driveline center support bearings have robust brackets made of reinforced heavy-gauge cold-rolled steel for strength and durability. A rubber cushion inside each bracket provides support to absorb and isolate vibrations, extending service life in rough environments. 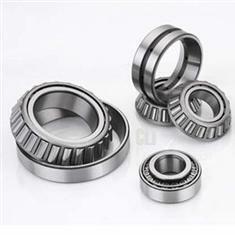 Timken bearing inserts are pre-greased and pre-sealed with an additional grease barrier between the bearing retainer caps and sealed bearing to extend bearing life.